Metal plate may interfere with wireless charging. So please remove the metal plate when you want to use the wireless charger. Or you may place the metal plate directly on your phone case, and just remove the phone case when you use a wireless charger. 4.If your device is larger like iPhone 7 plus 6 plus or others, to make sure the phone is held more securely, our suggestion is to use our larger round Black metal plate. 2.Make sure the temperature of your dashboard is not high before sticking the mount or it may disable the adhesive tape. (For any adhesives included 3m brand company's one also will be melted and weakened its stickiness as parked in the direct sun for a long time. In that case, please replace the adhesive tape with extra one provided). 3.Tear off the red protection film of the base and stick it directly on the dashboard, and then press the base with much force for about 1-3 mins. 4.Wait at least 24 hours before using the mount. 5.Adhesive tape can only use once.If you really want to move the postion, please use a new adhesive tape. 360° Rotation: This magnetic car phone mount with its unique design allows you to rotate your phone and device at your will to achieve the best angle of view. 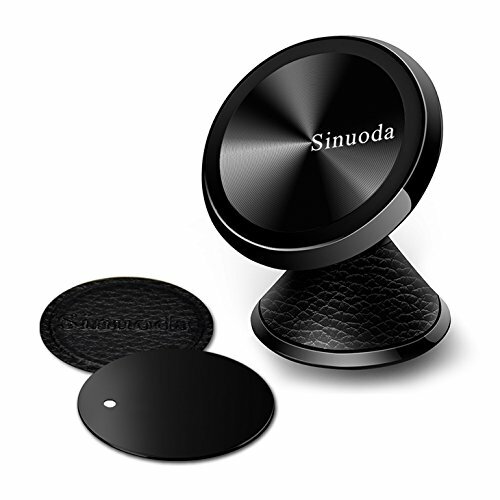 Powerful Magnetic Car Mount: This magnetic phone mount uses Four N50 neodymium magnets which has the strongest magnetism. It can always keep the phone in place even on the bumpy roads. Universal compatibility For 4-8 Inches Smartphones: This car phone holder is compatible with iPhone,Samsung Galaxy, HTC, LG & more smartphones, and GPS. Multi-scene Use Magnetic Phone Holder And Suitable For Any Flat Surface.This phone mount can apply to car dashboard,desk surface or other flat surfaces. When you install it,press firmly about 1-3 minutes and better to wait at least 24 hours after installation before application. Air Vent Car Phone Mount Holder - Car Phone Mount for iPhone X 8 7 6 5 Plus Samsung and any Cell Phone - Phone Holder for Car - Universal Vent Mount for Men and Women - Vent Mount - Vent Holder.